Designed to conveniently fill a wide range of bulk bag sizes. 316 stainless steel on product contact surfaces. Power-Lift™ fill head height adjustment system for ergonomic operation and system flexibility. 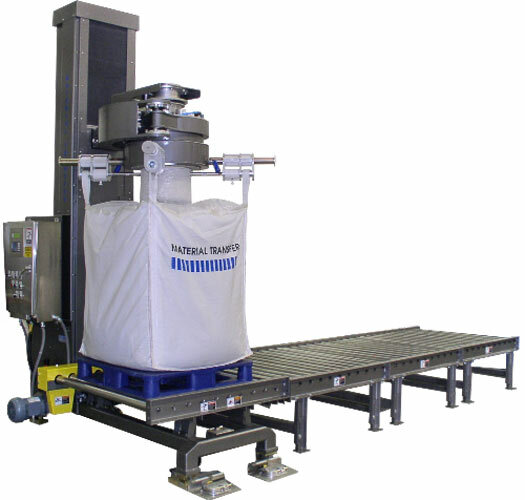 Easy-Load™ bag hanger system rotates, allowing operator to easily load the bag while standing directly in front of the filler unit. Dust-tight inflatable spout seal allows for a complete bag fill without risking material spillage, dusting, and contamination. Loop-Lok™ pneumatic bag strap release system streamlines the bag unloading process, allowing the operator to focus on beginning the next fill cycle. Fully integrated gain-in-weight scale system with electronic weighing terminal and digital display. Powered roller out-feed conveyor system with sealed bearings and galvanized rollers. NEMA 4X stainless steel Hoffman enclosure, wash down ready. Fully programmable PLC controls with touch screen operation.